Maximum size: about 76 mm (Hoover, 2006). Identification: This is a flattened, sand-dwelling species that is highly variable in color. Light animals are usually cream to light brown shading to dark brown near the margin. They usually have a fine, bluish-white marginal line and are mottled with orange and white. Often, there is a purple patch on the "tails." Dark animals are velvet-black margined in blue but various intergrades are common. Occasional animals may be white with violet-tipped "tails." Natural history: Philinopsis speciosa is a common animal found in open sand and Halimeda kanaloana beds at depths of 9-27 m (29-90 ft). Occasionally, it may also be found in mixed habitats at moderately exposed to highly exposed sites in depths of as little at 1 m (3 ft). Mature animals are usually nocturnal but younger ones may sometimes be seen in numbers crawling on the surface by day, particularly in Halimeda kanaloana beds. It feeds on sand dwelling haminoeids. (Note 1) It has also been observed eating the sea hare, Stylocheilus striatus. (Mike Roberts, Sea Slug Forum). Its egg mass is an elongate, white sack composed of a tangled egg string. Egg masses are typically anchored in sand and are often found in pairs suggesting that both animals in a mating pair may lay before separating. Distribution: Big Island, Maui and Oahu: widely distributed in the Indo-Pacific; also in the Eastern Pacific. Taxonomic notes: It is referred to as the "blue headshield slug" in Hoover, 1998 and the "blue-margin headshield slug" in Hoover, 2006. It was first reported from Hawaii in Pease, 1860. Philinopsis cyanea is a synonym. (Gosliner, et. al., 2008) It's listed as Aglaja speciosa in Pilsbry, 1921 and Edmondson, 1946. Photo: CP: 60 mm: Hekili Point, Maui; Nov. 14, 2008. Note 1: A 15 mm animal brought in on April 28, 2005 was held in a dish with a sand bottom for several days. It regurgitated the shell of a small Atys(?) debilis one day later confirming that it had eaten that species in the field. When offered a somewhat larger A(?). debilis it "half-engulfed" the Atys but the latter broke free with vigorous swimming motions and remained uneaten in the dish for several days. When offered a small Atys(?) 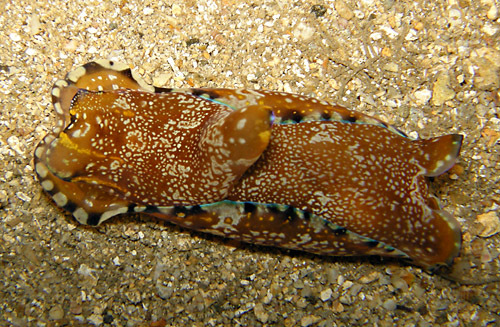 multistriatus, the Philinopsis ate it immediately, regurgitating the shell by the following day. When offered a small Liloa curta, it rejected the animal when it was presented "head first" but successfully ate it when it was offered "tail first." Again, it regurgitated the shell by the following day.